Around every bend of the rolling country lanes that criss-cross the neatly organised hills of Chianti there seems to be another reason to slow down and carefully frame another picture. 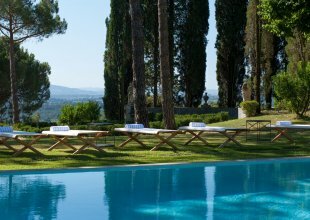 The countryside around Badia a Passignano is some of the very prettiest in the region, lushly ordered vineyards, verdant hills and terraces of olive groves punctuated by some of the loveliest looking medieval hilltop towns and villages. 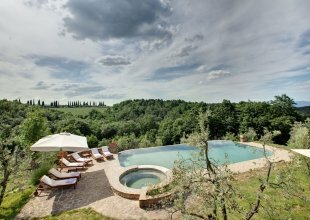 Bordering the famous Marchesi Antinori vineyards, with views of the 10th century Abbey of Badia a Passignano, La Badia sits on a hill covered by original Tuscan oak woodland, a privileged spot in the middle of Chianti. All the great villages of Chianti, its world-famous vineyards, the great art cities of Florence and Siena and the medieval towers of San Gimignano are all within easy striking distance. The position is about as ideal as possible for families or groups of friends to explore and enjoy Chianti. The house itself is stylish and beautifully modernised without taking away its sense of antiquity and heritage. Silvia, who is the local manager of the property also doubles up as a superb cook! The entrance hallway with its thick stone walls, vaulted ceilings and clay tiled floors sets the scene. To the right is one of the most wonderful of classic country kitchens, with a timeless long oak table, aged wooden benches, wrought iron chairs, white marble sinks, white-washed beamed ceilings and pale-honey walls with pale blue shutters. To the back of the house is an elegant and stylish dining room with an eclectic mix of dressers and furnishings that meld brilliantly together. Doors from all ground floor rooms open up onto the lovely grounds and an al fresco dining table under a shady pergola. The dining room and two spacious and light ground floor living areas lead out onto the striking swimming pool area. In addition there is one ground floor bedroom that can be made up as a twin or king with en suite bathroom and there is also a downstairs guest bathroom next to stairs that lead up to the first floor. The first floor leads to the dovecote (Colombaia) where the nicely laid out first floor has 4 further bedrooms, a large living room and a small snug room with sofa. Stairs lead upwards into the dovecote where there is a further bedroom.